HELP US PREVENT DOG & CAT OVERPOPULATION! Neuter or Spay your pet! You must call 713-522-2337 to schedule an appointment. Free spaying and neutering is available from the SNAP mobile spay-neuter clinic to Fort Bend County residents who qualify. IMPORTANT: The selection process has changed. Services offered by the SNAP clinic are no longer on a first come, first serve basis. Individuals seeking spaying or neutering services must call 713-522-2337 to schedule an appointment. During your call, you will verify that you are Fort Bend County resident and you will also schedule an appointment for your pet to be spayed or neutered on May 16, 2017. On the day of the appointment, you will need to bring a valid photo I.D. and proof of participation in the following programs: food stamps, free lunch program in schools, Medicaid, Major VA Disability, Section 8 Housing, SSI/SSD, TANF, WIC, or if you are 65 years or older. REMEMBER: No food for your pet after 10 p.m. Exceptions to this rule are pets that are 4-6 months old. All animals MUST be brought on a leash or in a carrier. If you do not qualify, please call 713-862-8001 for information on reduced-cost options to spay or neuter your pet. ¡AYÚDANOS A PREVENIR LA SOBRE POBLACIÓN DE PERROS Y GATOS! ¡Esteriliza tu perro o gato! Usted debe llamar al 713-522-2337 para hacer una cita. Los residentes del Condado de Fort Bend que califiquen pueden recibir servicio gratuito de esterilización para su perro o gato en la clínica móvil de SNAP. IMPORTANTE: El proceso de selección ha cambiado. Las personas que buscan los servicios ofrecidos por la clínica móvil de SNAP ya no son elegidos por sorteo. Personas que buscan servicio gratituo de esterilización tienen que llamar al 713-522-2337 para hacer una cita. Para verificar que usted es un residente del Condado de Fort Bend, llame al 713-522-2337. Durante la llamada, tendrá la oportunidad de hacer una cita para la cirugía de su mascota el 16 de mayo del 2017. Por favor de llevar una identificación con foto y algún comprobante de su participación en uno de estos programas a su cita: estampillas para alimento, comidas gratis o a precio reducido en las escuelas, Medicaid, Descapacidad de VA, Vivienda de Sección 8, SSI/SSD, TANF, WIC, o prueba de que usted tiene 65 años o más. RECUERDE: No se debe dar comida a su perro o gato después de las 10 p.m. Las excepciones son perros o gatos de 4-6 meses de edad. Todos los animales deben de ser llevados en correa o en un portador. Si no califíca, llame al 713-862-8001 para información de servicios de esterilización de bajo costo para su mascota. This PHI talks about about Zika and Spring Break travel, fighting the flu, personal preparedness, Tuberculosis, and a POD exercise. 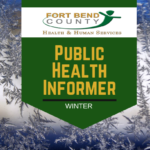 During your call, you will verify that you are Fort Bend County resident and you will also schedule an appointment for your pet to be spayed or neutered on March 15, 2017. On the day of the appointment, you will need to bring a valid photo I.D. and proof of participation in the following programs: food stamps, free lunch program in schools, Medicaid, Major VA Disability, Section 8 Housing, SSI/SSD, TANF, WIC, or if you are 65 years or older. Para verificar que usted es un residente del Condado de Fort Bend, llame al 713-522-2337. Durante la llamada, tendrá la oportunidad de hacer una cita para la cirugía de su mascota el 15 de marzo del 2017. Por favor de llevar una identificación con foto y algún comprobante de su participación en uno de estos programas a su cita: estampillas para alimento, comidas gratis o a precio reducido en las escuelas, Medicaid, Descapacidad de VA, Vivienda de Sección 8, SSI/SSD, TANF, WIC, o prueba de que usted tiene 65 años o más. Fort Bend County Health and Human Services and Medical Reserve Corps will hold it’s annual Point of Dispensing exercise at Hightower High School On March 4, 2017, the Fort Bend County Health & Human Services’ Public Health Emergency Preparedness Program (PHEP) and the Fort Bend County Medical Reserve Corps (FBCMRC), a local volunteer organization, will exercise its Mass Dispensing Capability at Hightower High School. As part of the Centers for Disease Control and Prevention’s (CDC) Cities Readiness Initiative, PHEP and MRC will test its ability to activate a Point of Dispensing (POD) to quickly provide medication from the CDC’s Strategic National Stockpile to local communities. The federally funded program is designed to enhance preparedness in densely populated areas. The Strategic National Stockpile is a large national supply of medical countermeasures available for use during a public health emergency, such as a bioterrorism attack or an influenza pandemic. The exercise scenario will involve a simulated anthrax attack and will engage MRC volunteers, the Missouri City Police Department, Missouri City Office of Emergency Management, the Fort Bend Independent School District, high school students, and other local partners. For more information on how you can participate, contact Cornelia Jammer at 832-425-8524. For information about the exercise, please contact Yaneth Ramirez Calderon at 281-238-3551.